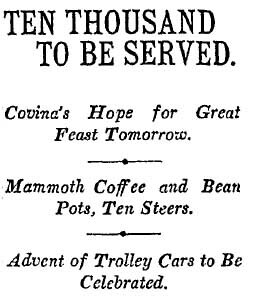 Lavish preparations are underway for an enormous, free picnic to celebrate the opening of a Pacific Electric streetcar line to Los Angeles. 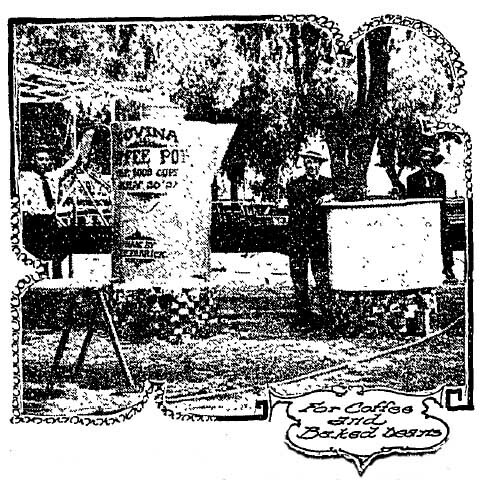 “Covina had long awaited the approach of those shining iron bands that connect the pretty little valley town with the metropolis of the West, and is very happy,” The Times said. E.H. Fabrick has created a gigantic coffeepot for the occasion, holding 250 gallons. “A large man looks like a pigmy beside this immense urn, fashioned for a race of giants,” The Times said. It’s accompanied by an equally enormous, 300-gallon bean pot patterned after an original (presumably normal size) pot in a Boston museum. A 45-foot trench has been dug to barbecue 10 steers and a dozen sheep and pigs and a quarter-mile of picnic tables has been constructed. Events for the grand celebration include sack races, climbing a greased pole, catching a shaved pig and band concerts. As a special treat, Ellen Beach Yaw, “The California Nightingale,” will give a vocal recital. Bonus factoid: Ellen Beach Yaw, who founded the Lark Ellen Home for Boys, died in Covina on Sept. 9, 1947.